OSWEGO, NY – Members of the Greater Oswego-Fulton Chamber of Commerce Golf Committee are busy finalizing the details for one of the chamber’s most popular events, the Annual Golf Spectacular. 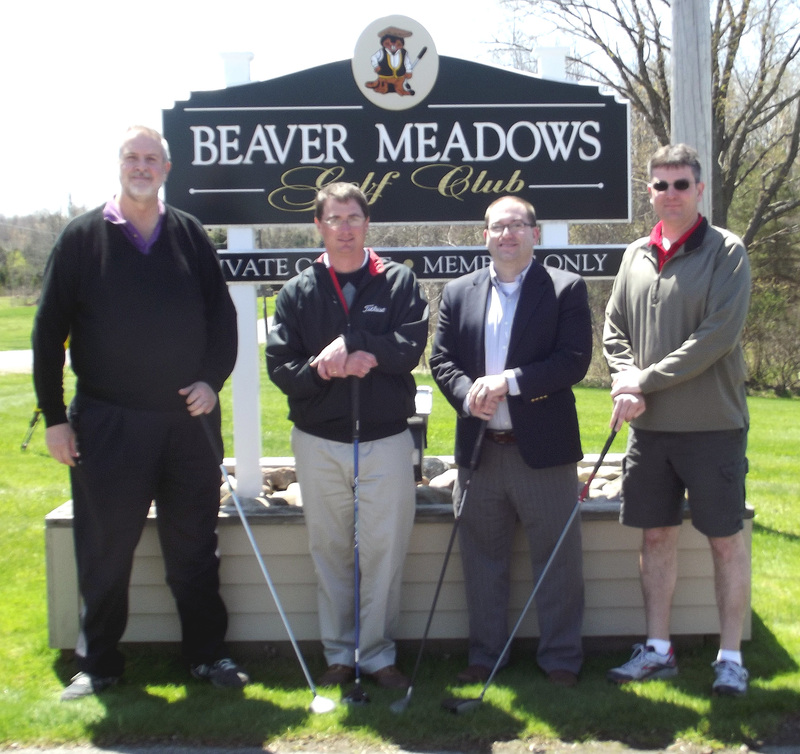 Members of the Greater Oswego-Fulton Chamber of Commerce Golf Planning Committee meet with head golf professional at Beaver Meadows Golf Club, Alex Smith (second from left) to discuss details for the Annual Chamber of Commerce Golf Spectacular. From left with Smith are planning committee co-chair John Zanewych of Big John Sales; interim executive director of the Greater Oswego-Fulton Chamber of Commerce, Nathan Emmons; and committee member Brooks Wright of KBM Management. Absent from photo are committee members: Aaron Roth of Northwestern Mutual, Deana Michaels of Pathfinder Bank, Bill Hubel of Blue Moon Grill and Carol Dillabough of the Oswego Elks Lodge #271. Last year, more than 100 members hit the links to enjoy a full day of fun and golf with their fellow members. The 2014 Chamber Golf Spectacular features chipping and putting contests; prizes for longest drive, straightest drive, and closest to the pin; a skins game; and two hole-in-one contests: one for a chance at $10,000 courtesy of the John FitzGibbons Agency, and one for a chance to win a new automobile courtesy of Burritt Motors in Oswego. New to this year’s event is the $1,000,000 Hole-In-One contest! The chamber is currently accepting registrations for members wishing to play in the 2014 Chamber Golf Spectacular. An entry fee of $450 per team of four golfers includes green fees, cart, lunch, and a full steak dinner following the event. All registrations must be received no later than June 2.